After a year of planning and waiting, I finally completed my first trip to Kyoto. I managed to upgrade my ticket from economy to first class just one week prior to my departure. 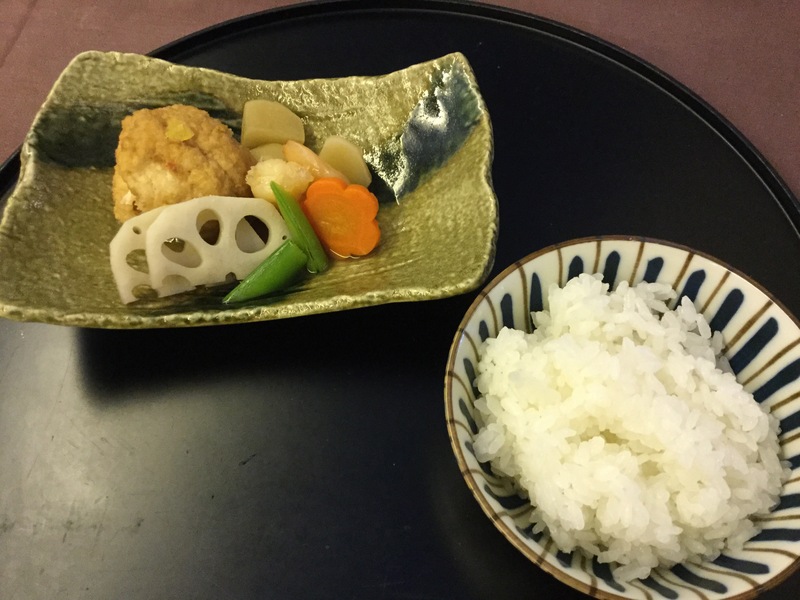 The extra miles it cost was well worth it, as I thoroughly enjoyed my JAL First Class SFO Haneda flight! At SFO International terminal, Japan Airlines check-in counter is located at Aisle 12 (closest to security entrance) next to Alaska Airlines. When we arrived around noon for our 3:05pm flight, there was barely anyone in line. Since I was flying First Class and allowed 3 pieces of luggage, I put all of our luggage under my name. I asked the agent if there was a window seat open, as I was only able to get a middle seat online. She told me both 1A and 1K were open (apparently these two seats often blocked online). I happily took 1A! The agent was kind enough to check my best friend and the kids in as well (they were flying in coach). She printed all boarding passes including our morning flight connecting from Haneda to Osaka, but reminded us to pick up our luggage upon arrival and recheck again tomorrow. 15 minutes later we were on our way to security. For whatever reason, the priority line was longer and slower than the regular line. I sticked with my group and we cleared security in less than 20 minutes. I didn’t bother to go to JAL’s SFO lounge as all reviews I read were not good. We got the kids some lunch and then headed to our gate A6. The plane was already there. Shortly before the 2:35pm boarding time for the flight, at least 12 JAL agents showed up at the gate! As soon as 2:35pm hit, different agents hold up different signs and standing at different point of the boarding line. First Class being first, I was on my way after 3 agents looked at my boarding pass and passport. The strangest thing was they boarded the whole plane from the very front! Passengers sitting in Economy class walked through First Class, Business Class, then Premium Economy before reaching their seats in the back of the plane. But in the typical efficient Japanese way, boarding was completed in about 20 minutes and we were on our way exactly at 3:05pm! Why can’t any domestic airlines do that?! Just like I expected, JAL First Class SkySuite was big and spacious. I spent a good half an hour looking for an outlet plug so I could charge my phone. Oddly it was located inside a hidden compartment in the far left corner of the suite, next to the monitor screen. Next time, I’d better bring a 6 feet long cable! 3 windows and 1 big monitor, what more can you ask for? The seat was wide and there was a bench on the opposite side below the TV. Just like the first class in Cathay Pacific, two people could sit comfortably in the suite and enjoy a meal together. The first class cabin, which has only two rows and a total of eight seats, had two empty seats in 1D & 1G. But the guy who sat behind me in 2A, dined with his friend in 1K during the flight, then used 1D to sleep and 1G to work. Why he did that was beyond me! Waiting for me at the seat was the Bose headset, the JAL amenity and the slipper. I always found myself overwhelmed by too many remote controls and too many buttons! Flight attendant Narume came by and handed out the custom form and free wifi code. If you are looking for JAL premium alcohol lists and pictures, sorry to disappoint you, as I don’t drink (not in the air anyway). The drink list was extensive, and you can find it on JAL website here. I did try their premium Japanese tea – the Royal Blue Tea “Queen of Blue”. Served in room temperature and in a wine glass, the tea was exceptional – fruity with strong aroma, natural taste and shiny color! It paired very well with my entire meal. I probably drank a whole bottle! JAL prides itself with its signature BEDD (bed, dining, delicious and dream) service in the sky. Today’s flight featured cuisine by chef Naoki Uchiyama. I love Japanese food so naturally I chose the Japanese meal. Each course was beautifully presented. First course was five little dishes – clockwise from the center were warm scallop cake, warm potato dumpling, cold jellied sea urchin, cold fried black cod marinated in vinegar sauce, and marinated herring roe & poached watercress. I really enjoyed the first two very much, and was surprised by the sea urchin but it wasn’t as bad as I thought! Then came the clear soup with grilled salmon, which was very tasty and not like any salmon I had before. But after this soup, I had to ask Narume to skip the miso soup in later part of the meal. I couldn’t drink any more soup! However I asked her what the sushi would be and she bought me a plate! Unfortunately it was kind of dry. The parched fluke with soy milk sauce was interesting, same as the abalone simmered with seaweed, yam and pickled plum. I honestly had no idea what I was eating until I read the menu again! For the main dish, I had plain steamed rice to go with the fried tofu ball filled with snow crab meat and simmered prawn and turnip. I was beyond stuffed! Narume came over with dessert and gave me both the Japanese bean cake and strawberry moose from the western menu. I ate nearly half of the strawberry moose, which was more like a jelly. It smelled really good and fruity! Two hours before landing, I decided to have a snack. I wanted to try both the curry and the udon, but did not want full size of each. Narume offered to bring half size, but it was still a lot. The cabin was too hot! After dinner, the cabin was dimmed and I spent sometime working. Narume came by and asked if I would like to get my bed made. I decided to take a short nap and asked for the pajamas. Oddly she took my clothes away from me after I changed into pajamas. Must be a Japanese thing? Cathay Pacific flight attendants never took my clothes. The bed was comfortable. But I woke up sweating after a few hours. The cabin temperature was hot! Narume told me that they just adjusted it down. The temperature was centrally controlled. Reading Dan’s review of JAL First Class ORD NRT, apparently the hot temperature in JAL cabin was a common thing, I had the same issue on my return flight as well. Overall, I enjoyed my 11 hour flight in JAL first class SFO Haneda. Service was attentive and friendly, though flight attendants’ English seemed to be somewhat limited. Between pointing and smiling, we communicated fine. The food, the seat and entertainment were all great. The wifi was kind of iffy at times. My only complain would be the hot temperature in the cabin. Despite of that, the additional miles it cost to fly in First Class compared to Business class was still well worth it. Maybe the hot cabin is a One World standard? Everytime I fly on AA or JAL to/from Japan the cabin is hotter than a desert in the summer. Literally, I’m like “do these windows open!?!?”. I can’t sleep covered in sweat. I’ve never experienced this on United/ANA. I didn’t find the same problem with Cathay though. Sounds like you think highly of yourself. or perhaps you are a sexist and lopere just called you out….who is to say? ” Passengers sitting in Economy class walked through First Class, Business Class” gives them something to aspire too. It’s called having double the number of rows on international flights. I flew ANA from SJC to NRT one year on their 787. Boarding was done fast in less than 15 minutes. Two people cannot sit and dine together even though they have the ottoman. We asked while she was sitting across from me and they said they couldn’t do it. Also, I’ve found that for hot cabins if you just fan yourself with your menu they will adjust the temperature lower. All the Asians in our J cabin were bundled up in blankets no matter what temperature it was, but I was always comfortable after they lowered it. This has worked on all of our CX and JL flights and we have taken quite a few of them in J/F. Interesting! The guy did it in 1K with his friend on my flight, ate the whole meal together. That’s weird, we had the entire F cabin to ourselves and they wouldn’t let us do it. I’ve heard from others that were also unable to do it. I was on JAL about a year ago and I remember how warm the cabin was. I am not sure why they keep it so hot. It is really uncomfortable especially when they provide warm blankets. It looks like the flight was otherwise enjoyable.